In honor of Brother's 100 year anniversary, the Quattro 6000D brings you 100 brilliant, unprecedented features. In honor of Brother's 100 year anniversary, the Quattro™ 6000D brings you 100 brilliant, unprecedented features. 50. Readable PHC files . Embroider with perfection, sew with unlimited creativity, quilt with ease and craft with brilliance. The large work area means greater room…room to design, room to create and room to be free. Free yourself from the stress of completing big projects such as quilts, jackets and home décor projects. Achieve the unimaginable with almost 50 square inches of workspace, nearly 36% larger than its predecessor. A spacious ten-inch x five-inch work area accommodates those larger projects you only dreamed you could create. Bulky sewing projects, large-format paper crafts and quilts up to nine inches in diameter are no match for the Quattro™ 6000D. Make the impossible…possible. We give you plenty of room to develop and perfect your skills. 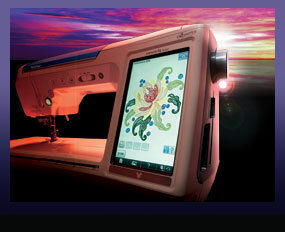 The spacious sewing area transforms into a canvas for impeccable design when the embroidery arm is attached. 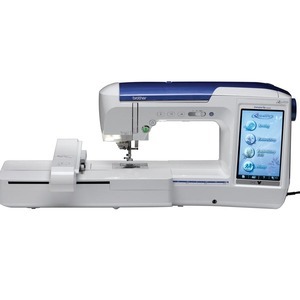 Go beyond your usual embroidery or quilting and experience its great sewing features, too. 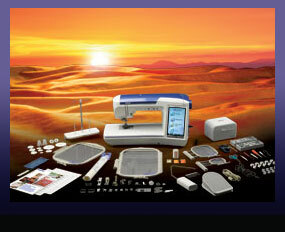 With the Quattro™ 6000D, you can sew with the embroidery arm on for a time-saving convenience. Embroider breathtaking designs with the jumbo 12-inch x 8-inch embroidery hoop. Use the built-in embroidery designs to complement your treasured pieces for the satisfaction of personal customization. More space means less re-hooping…less re-hooping means more time and less effort! State-of-the-art technology from Sharp Corporation brings optimal clarity and color to the wide-angle HD LCD display. A great visual field, nearly 32 square inches, delivers razor-sharp graphics, visibility from any angle and less interference from overhead glare. The 4.5-inch x 7-inch touch screen is nearly 18 percent larger than its predecessor, encompassing innovative technology from the leader in LCD displays. The wide-angle HD LCD display by Sharp Corporation offers vivid, crystal-clear lucidity rendering the brightest images imaginable with virtually no color shifting from side to side. View brilliant, high-resolution design renderings and stitch previews. Virtually instantaneous processing—three times faster than previous models—means stitch parameter adjustments and design edits are immediately rendered. 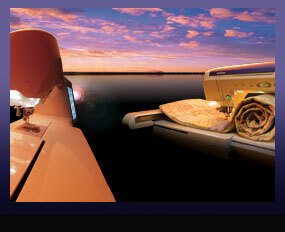 No more waiting to preview your designs…the Quattro™ 6000D knows time is invaluable. With large wide-angle viewing, the Quattro™ 6000D is easy on the eyes from any angle. Super bright and crystal clear on-screen icons tout an improved appearance—intuitive and ergonomic. Boasting a three-dimensional look and larger space, the functions you use most are right at your fingertips. A simple touch of the stylus or a finger brings you closer to realizing your dreams. Most importantly, the Quattro™ 6000D is so easy to learn and use, similar to our other great products. 11 on-screen instructional videos guide you as you become a Quattro™ 6000D connoisseur. Enjoy the screen's expansive size as you learn step-by-step how to master your dream machine. Added personalization: Choose from 5 built-in screen savers, including Disney designs, to display when the machine is not in use. Or upload your favorite photographs and images creating your own custom slideshow. Whatever you choose, no matter the time…the Quattro™ 6000D will display your personal touch. Covering almost 10-inches of full-spectrum lighting around the needle, Brother’s exclusive Runway™ Lighting embodies museum-quality illumination, projecting clear, bright light onto your project. Colors are more vivid and brighter. The Quattro™ 6000D incorporates our latest light diffusing system as well as lens focusing technology to create a wider, more uniform area of coverage. Enlighten your touch with the best lighting in the industry. The runway is a place to shine, and your projects will radiate with Runway™ Lighting. Extra lighting is unnecessary as the Quattro™ 6000D projects a light intensity equivalent in power to 56 standard LED lights. Customize the lighting output by adjusting the angle under the needle to eliminate any shadows. Regulate the brightness between five settings, including an off mode, to find your ideal level. Brother's exclusive InnovEye™ Intelligent Eye Technology and Up-close™ Viewer give a bird’s eye view of the needle area. This industry first is like having a built-in camera above the needle plate. With instant magnification featured right on the LCD display, sewing, embroidery, quilting and crafting have never been more exact. Imagine how easy it will be to see your work up close and personal. By using InnovEye™, the needle-drop guessing game is over…elaborate designs and intricate decorative stitching are incredibly accurate. InnovEye™ Technology means precise needle placement for those hard-to-see areas - especially when attaching buttons and making buttonholes. Estimating stitch placement is no longer a hassle, leaving more time to dream the unthinkable and create the unbelievable. Edge sewing is so simple. InnovEye™ follows the edge and—guided by a pre-set seam allowance—keeps stitches smoothly hugging the edge whether they are straight or curved. Sew a long, thin piece of material, like a ribbon, with ease. 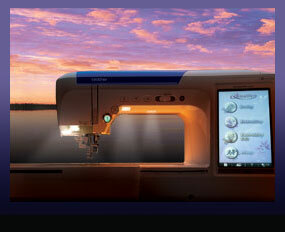 Even free arm sewing is made simple using InnovEye™ Technology to sew point to point. 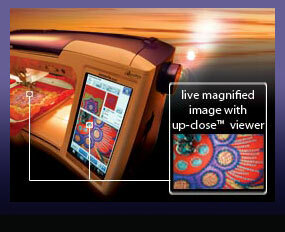 Utilizing a unique sensor positioning sticker placed on your fabric, the InnovEye™ Technology automatically positions the needle and design for perfect embroidery placement. No more starting over when you slightly mishoop your fabric! Let the InnovEye™ detect the sensor positioning sticker and make corrections for you! Additionally, use placement of the sensor positioning sticker to create beautiful fashions, including multiple embroidery designs, quickly and easily. Brother's exclusive Print and Stitch Technology combines printed images with embroidery designs to create your own 3D craft art. Complete with eight built-in backgrounds, including three Disney images, the Print and Stitch function is ideal for accenting apparel and home décor pieces. Frame your creations for a unique decoration. Or, even create your own wearable embroidery art. Every Accessory You Need: Standard! Explore the machine's innovation using the included accessories. Redefining the industry meant redefining every feature and function, especially the tools designed to save you time and effort. Embroider monograms and other small designs using the 1-inch x 2.5-inch and 4-inch x 4-inch hoops. The 8-inch x 8-inch square hoop is ideal for quilters. The 12-inch x 8-inch jumbo hoop accommodates larger designs and prevents the need for re-hooping. Achieve perfection with a wide array of feet including a vertical stitch alignment foot for effortless edge sewing as well as feet for buttonhole sewing, monogramming, free-motion quilting and echo quilting. Featuring improved stability, the two-spool thread stand is a great tool for multiple or specialty threads. Adjust the lever in three different positions for your ideal sewing position. Designed to fit within the arm of the Quattro™ 6000D, the accessory case allows you to keep all of your tools neatly organized. 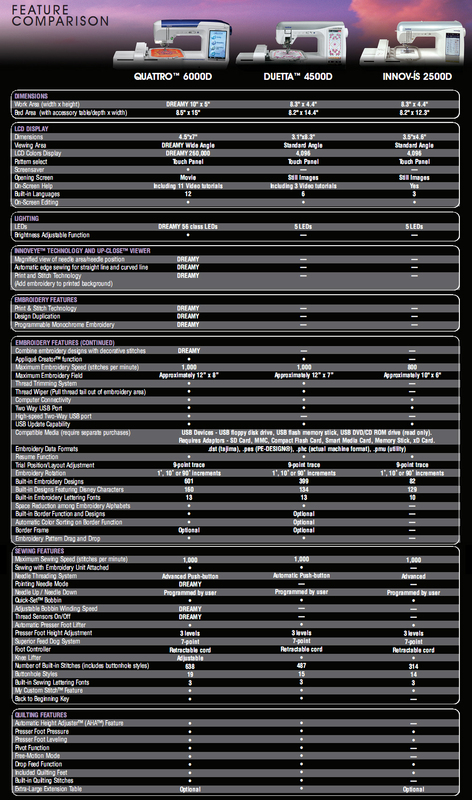 Click here to see how the Quattro™ 6000D compares to other high-end Brother machines.